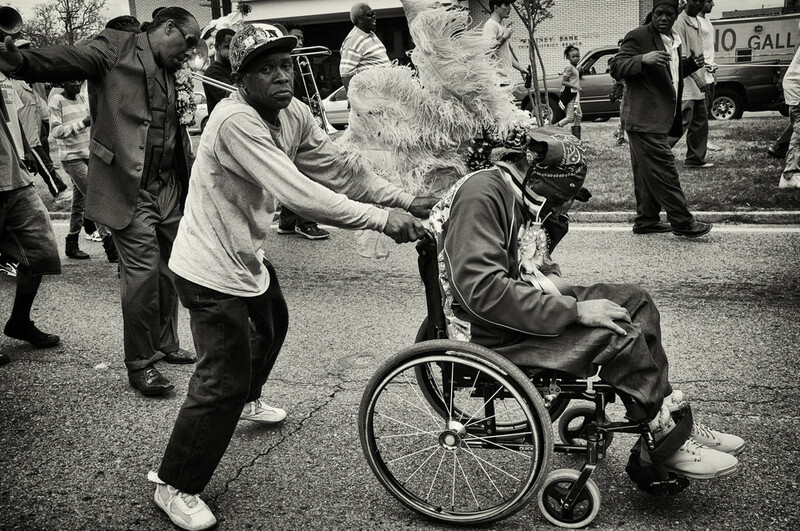 Yesterday was the Big Nine (Ninth Ward) Second Line. I went with my Funny Bone (my twelve year old daughter, she is in an all female bone gang- a walking, marching parade group- and that is her bone gang name). Second Lines are always more fun when she is here to come along with me as I cover the event. She told me once that going to work with me was like being in a Doctor Who episode, there was usually a lot of running involved. By now she knows how to stay close to me while keeping up with the crowd, how to stay close to the rope and when to move to the sidewalk so that we can run ahead and get in front of the moving mass of celebration once more. Second Lines are my favorite things about this city, the big-small parades that encapsulate the best part of the city, the music, the food, the joy, the survival, the pageantry, the culture. Every now and then I get tired of the oppressive and seemingly never ending heat, the crime rate, the crumbling infrastructure and think I want to move away, and then...then the brass bands starts up and there goes the trumpets, the trombones, the cowbell, the drums, here the Social Aid and Pleasure club members come out of the door with feathered paddles and bright suits and sashes...and then I know I am home.